For an average semi-detached house that needs a first floor chimney breast removed, you can expect to pay around £1500 for a professional job. That’s with fitting of gallows brackets in the loft, a concrete hearth to level the floor, new skirting and plastering. It’s a two-man job that can take up to three days. You will most likely have to finish off the decorating in the room or pay additional costs. Hypothetically speaking, if the job was carried out on the ground floor, whilst retaining the bedroom breast; the job would stretch to 4 days and £1775. Then for an entire chimney breast removal, leaving only the stack remaining, it becomes a 5 days job for £2050. You may need to allow for a further day and additional £250 if there is a lot of stripping and re-plastering that has to be done. To get quotes from trusted and vetted builders in your area. Fill in the form below. This service is powered by RatedPeople. The vast majority of us have moved to gas central heating within our homes and with that our chimneys have become redundant. Whilst few continue to maintain and repair them in tribute, it’s not always the best option. With age, many chimneys have become more trouble than they’re worth, even allowing damp to penetrate into the house. What’s the point of spending money to repair something you’re not ever going to use again? Then there is the issue of space, the chimney breast that protrudes into the room could free up usable space in many small homes. It’s not long before many consider a chimney removal. First of all, the word chimney is a broad term that refers to the entire brick construction running from top to bottom. Chimney breasts are visible on the wall of your home, spanning all floors. The hearths are where your fire would be stacked and flues refer to a square tube inside the chimney that carries out the smoke. Chimney stacks begin at the loft and emerge out the roof. From each hearth the flues lead up and out of the stacks through a number of pots. Semi-detached houses usually have chimneys that back onto one another. It’s fairly typical to see both front and rear room chimney breasts that join together in the attic and emerge out the roof as a single stack. Detached houses most commonly have chimneys at the sides and rarely in the middle. Removing your chimney does not necessarily mean everything from top to bottom has to be taken out. Not only would this job be monstrous, it would be expensive and require extensive design. Instead most will remove key sections depending on their requirements. Removing a chimney breast from a room in your house will help create more space within your home. If this is your intention then you may only require it to be completed in a single room. If rainwater is causing condensation within the chimney and your house you may even consider chimney capping. Since the chimney removal cost can be high this presents a cost effective alternative. Your type of house and chimney design is also a key factor when considering a chimney removal. You can’t simply remove the chimney breast from a bedroom in a fully detached house; otherwise the exterior stack will be left unsupported. Whilst it’s not a problem for semi-detached houses since the party wall has strong self-supporting brickwork. Also you can usually remove your ground floor chimney breast without causing too much imbalance. If you have adhered to the structural guidance, it does not mean it’s always practical or legal to proceed with work. It’s a major structural change to the home and will require guidance or clarification from a structural engineer. You will also need to contact local authorities and building control departments to clear your work. It’s a conformity that costs time and money but must be respected. It’s not just for your own safety but also to prevent later complications with building surveyors and selling your house. Party wall agreements need to be taken account of and honoured. Otherwise you will be footing any bills to rectify/undo discrepancies caused. It goes without saying that you need to ensure you have the full permission to modify the structure of your building, taking into account the restrictions on listed buildings and conservation zones. Get FREE Chimney Removal Quotes Today! With projects as significant as this it’s always wise to collect a number of quotes from qualified tradesmen. They may be able to point out aspects you hadn’t considered and allow you to attain if it’s worth doing yourself. How will you remove the bricks, dust and soot from the house? How will you prevent the spread of dirt around the house? Will you be contacting local building authorities on my behalf? Will you organise all building control documents? How much re-plastering will be required? How will the hearth be finished? Never allow them to dissuade you from contacting the local building authorities. This is not at all professional and will cause big problems for you in the future. You should also check they have public liability insure to cover chimney removal. If you’re planning on tackling this job yourself you need to get into contact with a local structural engineer, they can provide advice and designs for purposed work. Don’t be hesitant to spend money here, this will save time, money and headaches in the future. To ensure you receive a completion certificate from the local construction authorities, you must provide accurate plans. Gallows brackets are often used for supporting the chimney above a removed breast. Typically they are fitted either side of the loft stack with a length of steel to prevent bricks from dropping. It’s a slightly unsightly solution but it can often be hidden within the loft space. Any chimney breasts that are left to hang between can be secured using adjacent joists. Fitting a noggin with plywood underneath the breast prevents bricks from falling from the bottom. With loft conversions or other larger projects simple brackets may not be able provide the needed support. In these cases steel beams can be used to replace the load bearing materials. In some occasions your chimney may not be constructed on the party wall, be aware they are a different structure to other chimneys. Whilst you will still share a chimney stack, it will connect at ground level and not the loft space. It’s a dusty job so you will need suitable clothing and protective gear. Long sleeves, safety boots, mask, gloves and eye protection. You need to protect your home. Consider hanging plastic from the ceiling to reduce dust distribution and contain the debris. Try to create an enclosed work area with plastic sheeting and tape. Take it apart brick-by-brick. You can use a hammer and chisel for the smaller stuff and a mini impact hammer to speed through the rest. You may need to cut/remove ties to framing members as you go through the floor. Remember you will still need to finish the room. Cost and time can increase rapidly when you consider how to finish the room after the chimney removal. The hearth should have suitable flooring; the walls may need plastering and final decoration installed. If your property is semi-detached you need to ensure the chimney is yours to remove, or come to an agreement with your neighbour. Remember there are a number of building regulations you need to be aware of. You will certainly need to have scaffolding in place to ensure you can perform the job safely at height, DIY or professional tradesmen alike. Fitting a new layer of roofing felt, timbers and tiles. For a regular size chimney, two roofers can remove the stack in just half a day. Larger chimneys may take up to a day and a half. 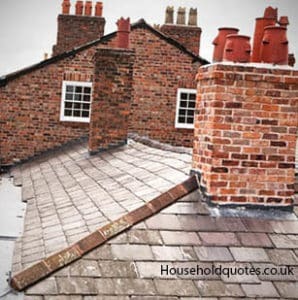 For removing the chimney stack, the cost can range between £1000-£1600 across most parts of the UK. It’s a labour intense job, if you’re confident and capable you could save yourself up to £500-£1000 in labour costs! Yet you still need to consult professional advice at the beginning. Keeping the building control offices informed along the way will also prevent troubles arising. If you are in any doubt, you can always have trusted tradesmen from Rated People come in to complete the job for you. I am considering putting in an offer on a property that will need two chimney breasts removed. This article was very useful to understand the scope and approximate cost of work. I have just had a homebuyers report back which revealed that the chimney breast at the ground floor level has been removed and that there is no evidence of any support having been added to support the chimney breasts on the first floor and the stack in the loft. Does anyone know how much it would cost to add support on the ground floor for the chimney breasts and stack on the floors above? It is a terraced house. A great article. I am just at the ‘what if’ stage – it would make a big difference to the room size but we are in a terrace, so I expect to leave the stack and just remove the chimneys. What would be the situation with putting an ‘alcove’ into a chimney breast? We have a chimney breast that comes through the upstairs bathroom. We would like to remove it but being an old victorian house and in a conservation area that may be more expensive and hassle that we would like. However to make a bit more space what I was thinking we could possibly do it to put in a beam, as like when you remove part of a wall and create an opening in the chimney that would then allow us to install a top and sink that would go back into this alcove such that they stick out only a small distance from the chimney breast. This would then allow a suitable sized gap to a proposed shower cubical on the other wall in place of the current bath. The chimney breast is about 1 metre wide and the opening would ideally be 60 to 70cm wide. Just about to buy a house with a chimney stack going into the kitchen ! The house is in a awful state anyway and will need to be done completely anyway. Have spoken to a builder but he never mentioned building inspector/regulations etc So will probe a lot deeper. I’m in the process of moving into a traditional semi, I want to remove a chimney wall from a bedroom upstairs, I would like to point out, the same chimney wall leads directly to downstairs living room where there is no chimney wall, Just a normal levelled wall. What will the average estimated cost be if I was to hire you guys? And now many days does it usually take? I have a 1960s bungalow, the original boiler sat in a brick alcove which adjoined the side gable wall and the kitchen/bathroom partition wall, the stack above the roof line has already been removed and I intend removing the stack which is left in the loft down to ground level to gain additional space in the kitchen, it is a traditional build with cavity wall construction so presumably only keyed into the internal brickwork skin. The stack in the loft area measures approx 60cm wide by 40 cm deep but enlarges at its base and in the kitchen measures 87cm wide and 58 cm deep with a height of 85 cm this is solid construction at the top with an opening of 74cm wide 58cm deep and 1m 60 cm high from the floor, the upper surface of the opening has been blocked up but the original outline of the flue liner is visible through the plaster repair. Any advice please?. This is a really helpful article. I’m planning a full chimney breast removal early next year. Having a better idea of the costs means I feel in a stronger position when talking costs with the builders. Thank you. Thank you so much. Earlier this year I moved into a bungalow with a chimney breast in the bedroom. I got a quote for removing it which was considerably more than your figures. I will now get some other quotes for comparison, using your questions as a guide. Most helpful.